Content — Homewood Bagel Co. PLEASE PARDON US! HBC IS CLOSED THROUGH SUMMER 2019 AS WE WELCOME A NEW BABY TO THE FAMILY AND PLAN WHAT’S NEXT FOR OUR LITTLE BAGEL BUSINESS. WE WILL NOT BE ACCEPTING ANY ORDERS DURING THIS TIME. IF YOU NEED US - PLEASE CONTACT US AT THE BOTTOM OF THE PAGE! LOVE TO OUR LOYAL COMMUNITY! HBC happily delivers fresh bagels and cream cheese to your home, office, or any destination every MONDAY, WEDNESDAY, FRIDAY, AND SUNDAY (other days may be available upon special request, but are not guaranteed). Please check our Menu and submit your request below. 48 hours notice, please. * Weekday delivery 6AM- 9AM; Weekend 7AM-10AM. *Menu prices inapplicable on Flash Delivery Days. * Because HBC bagels are always baked “same day” and are made to order, your order is not guaranteed until you receive a confirmation email. *Can I save my bagels for later? Certainly! Bagels will keep just fine on your kitchen counter for 1-2 days in their brown HBC bag (for best results also wrap in saran wrap). Simply toast or warm in the oven when ready to enjoy. For longer storage (up to 6 months) we recommend freezing your bagels. First, slice the bagels and wrap them (1-2) in saran wrap. Then, put that into a freezer Ziploc bag, removing as much air as possible. To enjoy, simply microwave for about 30 seconds, then warm or toast in oven or toaster. Over 12 hours of hand-mixing and rolling, cold-proofing, and malt-boiling coaxes six simple ingredients into a chewy, yet perfectly crackly, bagel. 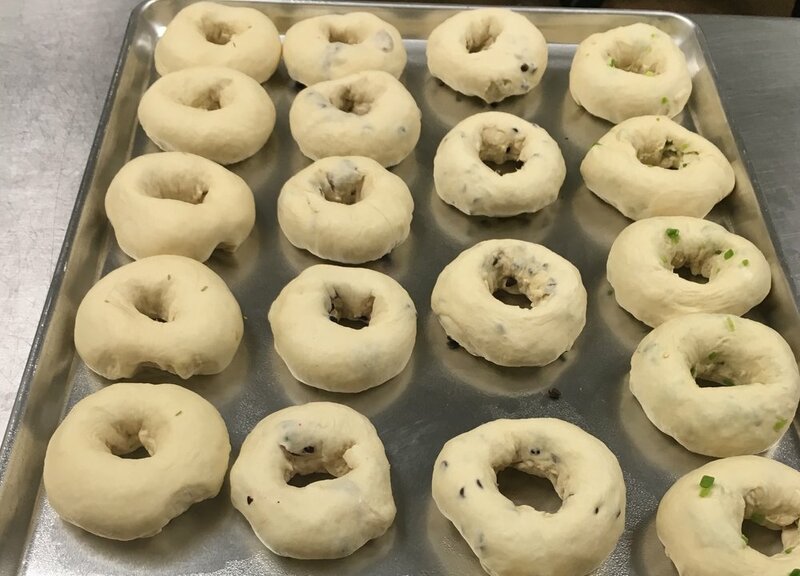 Our HBC bakers are artisans, mixing and rolling the bagels into the perfect shape, then putting them in the fridge for an overnight "nap", before boiling and baking them fresh for you the next morning! 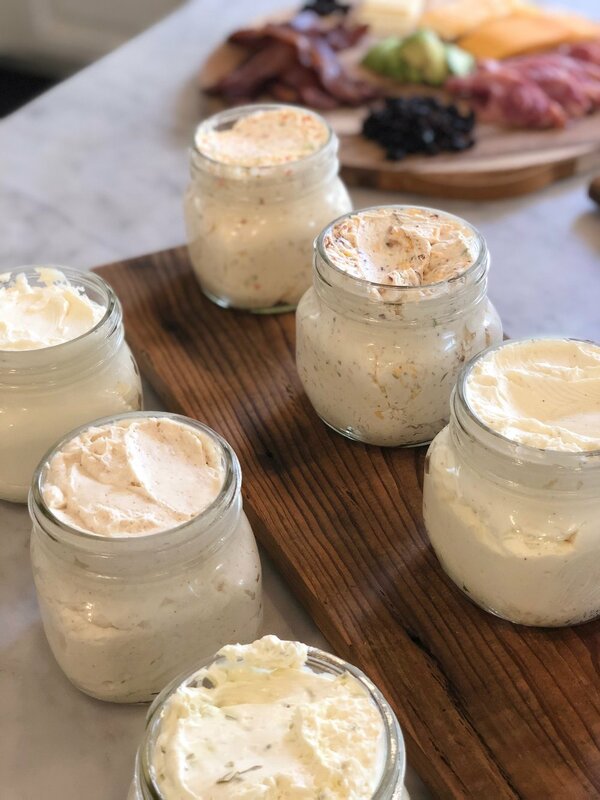 HBC also handcrafts its own cream cheeses from only the freshest ingredients, which pair with the bagels for an amazing meal. HBC is a family-owned bagel shop featuring handcrafted, fresh bagels made in Homewood, Alabama. HBC owners Joe and Ginny are raising their three kids in Homewood and while they couldn't imagine living anywhere else, weekends often found them venturing to surrounding areas in search of a good bagel. One such morning, they thought to themselves, "Why doesn't Homewood have a bagel shop?" And the idea for HBC was born. After nearly a year of testing recipes, doing tons of market research, and baking hundreds of batches of bagels, they've landed on the perfect bagel – soft and chewy on the inside, with a crunchy, blistered outside crust. Follow HBC on Facebook and Instagram to find our bagels and for delivery details! All bagels are not created equal. HBC loves Homewood, and we hope Homewood will love HBC handcrafted bagels & cream cheese as much as we do! 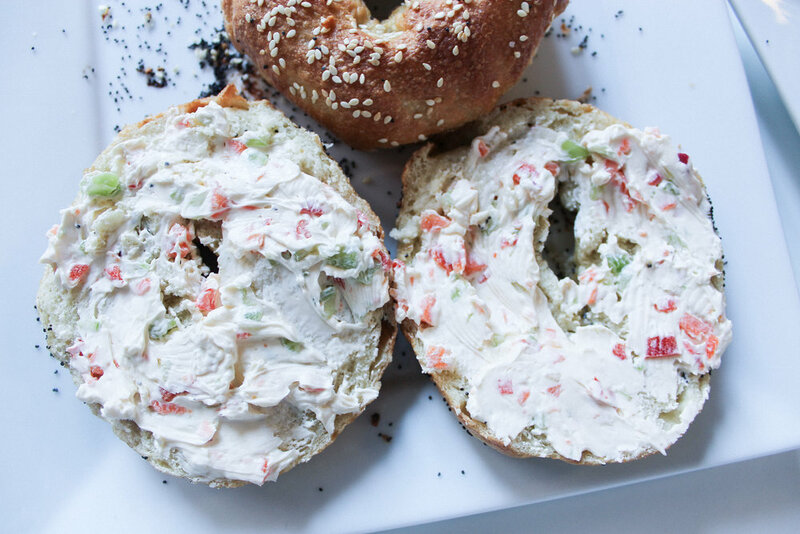 Take a look at why people can't stop talking about our bagels.